Last week a professor of new media, Pete Rorabaugh, contacted me with some interesting questions and a proposal. He wanted to discuss metanarratives. I smiled and nodded, pretending I knew what he was getting at. Metanarrative? About the case? The show? Couldn’t he see I was waist-deep in itty bitty details? Smothered in cell phone tower signals and call lengths, choking on manipulated or lost memories? But I listened with an open mind. And I realized that while I and others close to Adnan were mired in the minutiae of both the case and show, we were part of that case and show for the public. Our interactions online were being discussed, we were being judged and assessed, we were adding both entertainment and substantive value to the discourse. We were also characters in the larger story. Pete challenged me to think about how our characters were portrayed, what that meant to how our perspective was framed, how and why we reacted in particular ways, and what this ultimately meant for our lives and for Adnan’s case. It’s why I posted my last blog about the “loosey-goosey” comment because it wasn’t until I spoke to Pete that I realized oh hey, I was characterized a very particular way. Not only with that comment, but also through the description of my work. The Serial team met me at my one-room law practice, which I frequent about twice a month, but they also know that I work with some fairly prestigious institutions on national security related matters, I’m a frequent public speaker and writer, and have a bit of a public profile totally unrelated to the case. So while the bulk of my work includes consulting with federal agencies and managing CVE (“countering violent extremism”) programming, no one would ever guess that from the show itself. My credibility was downplayed. And that was purposeful. All of it is purposeful. But I never really thought about it because I couldn’t extract myself from arguing about Asia’s letters or the labyrinth of Jay’s timelines (as if winning arguments on the internet is a thing). So I’m grateful to Pete for forcing me to take a few really big steps back and think bigger picture questions, and I’m also grateful that he proposed a media project in which he’ll be helping parse those questions through a series of live online conversations starting next Monday, November 3rd. Going forward, every Monday at 1pm EST I’ll be chatting with Pete live on a Google hangout about the previous week’s episode. We got the ball rolling by taping an initial conversation that you can find here. I anticipate our future conversations will be about 30 minutes long, but this first one took a bit longer since it’s an introduction to the project. 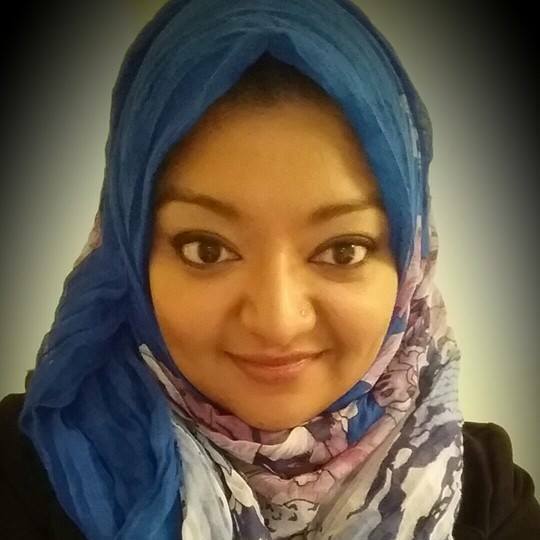 The link to the live conversation will be tweeted out beforehand (you can follow me @rabiasquared or follow Pete @allistelling) and I expect we’ll be open to twitter questions and thoughts as we discuss. Pete has created the hashtag #SerialNarrative to get the conversation started – you’re welcome to begin tweeting thoughts, comments, questions using the hashtag starting now. 1) There is no such thing as too much makeup on camera: I was on Al Jazeera for my first in-studio media appearance a couple of weeks back. I asked the makeup artist something terrible. I asked her “are you going to make me look crazy?” I am really lucky that she didn’t kick me out of the chair and even luckier that she made me look so terrific that I didn’t really even resemble myself. I watch the Google hangout video and I miss that makeup artist. I need that makeup artist. I may even love her. 2) I ramble. A lot. And I use the phrase “having said that” a lot. I am sorry. 3) Do people really want to hear this? I’m not sure. 4) Pete is very smart, thoughtful and cool. I’m glad he found me. 5) Saad and Yusuf should join in these convos too. 6) I’m a bit uncomfortable. I told Pete that. This project makes me feel like it’s about me. But it’s not about me, not for me. And I don’t want others to think it is. 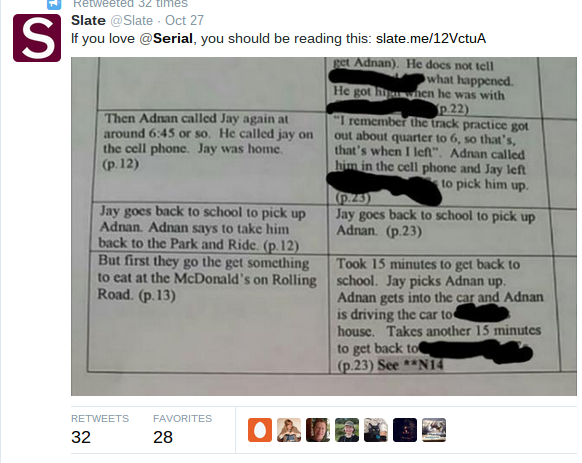 All of this, the blogging, tweeting, videos, is about Adnan. It’s about his innocence. That’s not just the end game, its the only game.